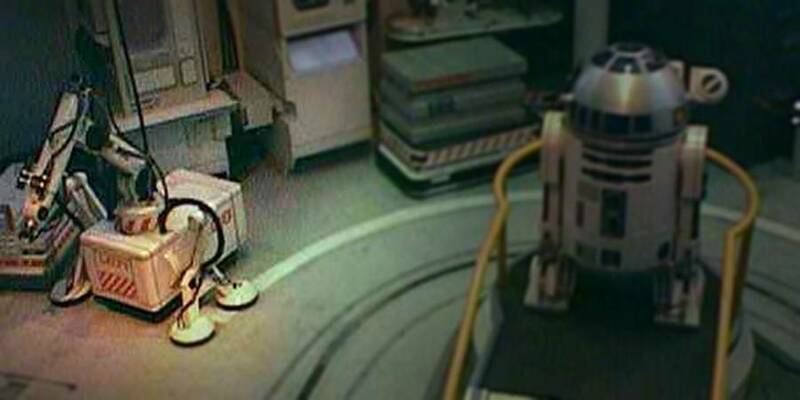 S-4 is one of a pair of droids (along with P-6) who work underneath an elevated StarSpeeder in the repair bay. They bear a certain resemblance to the all-purpose robotic ‘scudders’ from a vessel called the Crimson Dwarf or the Red Midget or something like that. He is slightly smaller than his companion P-6 and seems to have low-yield repulsorlift pads for locomotion. His major function is to control incoming baggage. For this S-4 is equipped with radar, [sun?] glasses, and a flyswatter. S-4 and P-6’s work is overseen by an unnamed R2 unit. From the text of a Tokyo Star Tour poster, translated by Martin Thurn.